About this time of year, there’s never a shortage of Blogs about Lent. Like this one, detailing nineteen things you can give up for Lent that “aren’t chocolate.” I’m going to review the list daily throughout Lent, and then a buncha other stuff. For example, I’m going to follow along with Dynamic Catholic‘s Best Lent Ever program to be my guide. And below all of this, you’ll see my own personal list. But what really has me inspired this Lent is, well, my son. He’s twelve, and my family was sitting around talking about what we’re doing for Lent and most of us had the typical stuff. My girls were giving up candy and pop, and my older daughter actually had some pretty lofty and inspired goals, and I was listing off way-t00-many things, as I’m known to do, and my thought is always this: if I stick to 50% of the things on my list, well, I’m good. How ’bout we dig into that? The conversation turned toward Confession and I threw the random thought out there, “maybe I should go to Confession during Lent,” kinda with the same conviction I might say, “I should start flossing every day,” or, “I’ll switch to decaf.” Sounds good, but let’s face it, I ain’t flossing every day and I love my caffeine. “Maybe I should go to Confession,” I said, and my kids all said, “we’re going to Confession Friday.” I told them I thought that was “great” and also was filled with pride about the decision to send my kids to Catholic schools. Hey, world, look at my kids. They are good and decent human beings. They will make the world a better place. And then it was like a needle was pulled across a record album and my indignation, self-satisfaction, and arrogance was ripped into pieces. I broke into a cold sweat. I panicked. I put a fork full of food in my mouth hoping the topic of conversation would change before I swallowed. What is this?!?!?! The Spanish Inquisition? I’m not on trial. You kids are like the FAKE NEWS with your gotcha questions. Everyone! Go to bed! How dare you?!?!? Instead, three sets of eyeballs were staring at me waiting for an answer (the fourth set of eyeballs, my wife’s, was looking away, out the window, as if trying to pretend she was distracted and not part of the conversation …clever …why weren’t the kids asking her?!!?!? Tick. Tock. Tick. Tock. Chew. Chew. Chew. Swallow. My brain was begging for a large tree to fall through the roof of my house. Or a power outage. Or a ninja to fly in through the window forcing me to fight said ninja off with my fork and knife. But no such distraction came. Only three sets of eyeballs, belonging to a 10, 12, and 14 year old, were looking at me waiting for an answer. “Dad,” they gasped in shocked awe. Oh, for your Catholics, it gets worse. Trust me, not for a minute did they think I was without sin in 30 years. “Dad! You should go,” said one. “I bet you’ve sinned alot,” said another. “I’ll go with you so you won’t be scared,” said another child. “Well,” I said, “it’s not like I’m really a bad person. I don’t even know what I would confess,” I continued, even though “bold face lie” to my children might be a good starting point. “Probably. Maybe. Only a few, I’m sure,” I replied. Suddenly I was regretting sending them to a Catholic school and regretting ever trying to be a good, Holy, and devout Catholic. Who am I kidding? I’m highly flawed. So flawed, in fact, my 30 years of avoiding Confession might be because I think I’m a lost soul and if a Priest heard my sins, he might just point at the exit sign. “Have you lied,” my daughter asked? The kids pressed further and it was revealed I’ve taken the Lord’s name in vain, I’ve coveted neighbor’s things, I’ve skipped Church (which is how Catholics “keep holy the Sabbath” at a minimum), and I’ve dishonored my mother and father. Crap! I’ve stolen a thing or two in my day (my much younger days, I promise) and when I was all confident in that I’ve never worshiped false Gods, my son pointed out I’ve skipped Church to watch football and basketball games and, technically, that was putting Michigan State sports above God and that falls under the “false Gods” thing. My son’s kind of a jerk, don’t you think? Hey. There isn’t a Commandment about honoring your children, so get off my back. For those keeping score, let’s just say my kids think I’m guilty of 7 out of 10, but let’s face it, if I’m guilty of coveting my neighbor’s oxen (the man has a damn fine ox), you and I both know I’d be lying if not even once in all these years I’ve never coveted something else. But let’s just go with seven. Seven. Commandments. Broken. 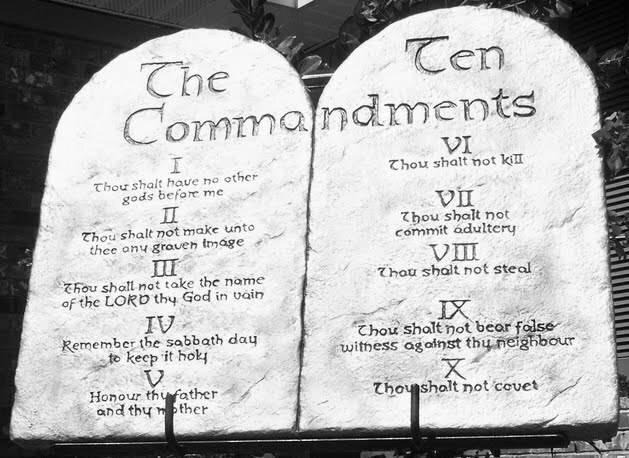 If you throw in the seven deadly sins (pride, envy, gluttony, lust, anger, greed, and sloth) on top of the broken Commandments, I’ve got my work cut out for me. But it’s work I need to do, and should do, and will better for doing. Did my oldest daughter come home from school the next day and inform me I shouldn’t be taking Communion each week in my current state? Oh, yes. That happened. Nice. Consider this Part 1 of my Lenten journey. The first step to fixing a problem is admitting you have a problem. So, during Lent, I’m going to use the six Saturday’s to attend Confession and work on forgiving myself, being forgiven, and making sure I’m a better person, now and for good. Here’s my Lent scratch pad. I’m sure right now you’re thinking I’m a horrible person. I’m not. I just need some fixing and Lent’s a perfect time for that. Stay tuned and I’ll pray for you if you comment and if you’re working on a great Lent, too. I was so focused on the needs of my family, which were serious needs, health and safety stuff. But all the same, I have drifted. Drifted away. I am not sure who I am coming back to Him.